Play as one of 10 African savanna animals and experience life in the wild as never before. 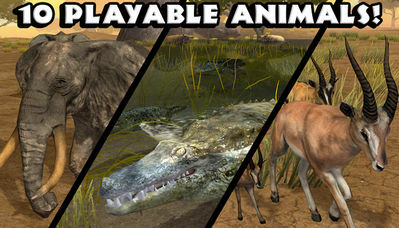 Ultimate Savanna Simulator for Android by Gluten Free Games is an animal sim that lets you become your favorite animal, find food, raise a family, survive other predators, and unlock exciting new playable animals! 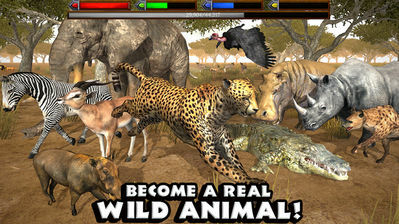 You can play as a Cheetah, Gazelle, Elephant, Crocodile, etc and build a life in the wild. Hunt down food and maintain hunger, thirst, and energy. Breed babies, care for your family, and fight predatory animals in epic boss battles to survive. Ultimate Savanna Simulator features gorgeous graphics, and addictive gameplay. Play and gain experience, stat points, and buff points to upgrade your animal character. Enjoy life in the savanna with dynamic weather, changing seasons, and day/night cycle! have fun!